Awards season enters its prime with the long-awaited release of Tinker, Tailor, Soldier, Spy, a new cinematic adaptation of John Le Carré’s acclaimed spy thriller of the same name. Entrenched in the mid-1970’s, George Smiley (Gary Oldman) is pressured from semi-retirement by Control (John Hurt), the head of British Intelligence, to expose an undercover Sovient agent within MI6’s ranks. His list of suspects include the wily Percy Alleline (Toby Jones), liberal Bill Haydon (Colin Firth), laconic Roy Bland (Ciarán Hinds), reticent Toby Esterhase (David Dencik) and then, of course, Smiley himself. An incisive, snappy, darkly brooding and remarkably faithful screenplay – penned by Peter Straughan and Bridget O’Connor – benefits in droves from its laid back approach and meticulous sensibility, accentuating every detail as if it’s as important as the last. While commendable in its accuracy and loyalty to its source material, this approach isn’t all its cracked up to be, as the film unfortunately falters from a lack of emotional depth. The sometimes all too plodding pace may also put off people not already familiar with Le Carré’s intricate writing style. Tomas Alfredson’s direction mirrors the screenplay’s style perfectly. He never lets the various action set pieces mould his approach. After the breathtaking success of his Swedish adaptation of Let The Right One In, it was always going to be tricky for Alfredson to choose an ideal sophomore feature. Thankfully, Tinker, Tailor, Soldier, Spy is just that. Alfredson’s understated direction, keen eye for production design and attention to detail in terms of strategy all emphasise the drab, cold, lonely atmosphere, allowing the audience an exacting account of life in MI6 while hiding from them the overall conclusion of the characters on screen. Oldman may come away with the most impressive, robust, Oscar-worthy performance, but that’s far from saying the supporting cast are without merit. Hurt is as marvellous as ever, while Firth and Tom Hardy continue to carve out respectable cinematic careers, the former honouring his position as a post-Oscar winning actor. Kathy Burke, meanwhile, in a brief yet integral role as former MI6 researcher Connie Sachs, is an utter joy to watch. Perhaps the least known of the central cast, Benedict Cumberbatch is entrancing as Smiley’s aide, Peter Guillam, cementing himself as a talent to keep a firm eye on. 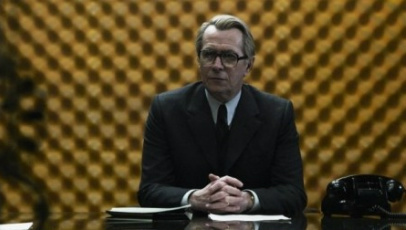 Tinker, Tailor, Soldier, Spy may fall short of being as resplendent as the hype seemed to imply, but that’s not to say it isn’t a film to be cherished and praised for its strengths. In fact, it’s a murky, meditative, exquisitely shot and nimbly acted espionage thriller that is, in its own right, an outstanding adaptation and distinguished follow-up to Alfredson’s Let The Right One In. Man, this looks really good. Oldman looks like he’s going for the Oscar. Give it to him! Can’t wait for this! Come on by my site when you can! I was very sceptical about it, right up until I saw it. Everyone kept likening it to The King’s Speech and saying it could be a real Oscar contendor, blah, blah, blah. But now, having seen it, I can say it really is as good as the hype. It may not win any big awards, aside from a Best Actor statue for Gary Oldman, but it’s well worth seeing and being appreciated as an individual piece of work, rather than simply “this years The King’s Speech”. As much as I agree with many of these reviews so far, I find few positive things to say about this film, it being about ageing spurned losers with emotional overload problems and extreme upperclass stereotypes. Walking around with little talking may pretend that your film is deep and murky but its just a cheap way of providing depth whilst skipping the all more difficult idea of character development. I also think it would be extremely difficult to watch without having read the book. Gary Oldman is supurb though, as usual.